Thaddeus P.J. Bear, content in a child's arms, bouncing around in a wagon, or relaxing in the back seat of a Rolls, is a worldly sort of teddy. He calls himself Tad for short, and wears a perky "here I am, what'll we do?" expression. Mischief and anticipation gleam in his brown glass eyes. Ready to play, he's fully jointed underneath a loose-fitting skin of soft gray-brown acrylic fur. He can twist his head from side to side and nod up and down too - truly a remarkable feat for a mere teddy. A wild-woods heritage shows in real-bear details like his stance, a slightly humped back, the prominent ears of a cub, a dab of a tail, and best of all, loose wrinkly fur that ripples when he moves. 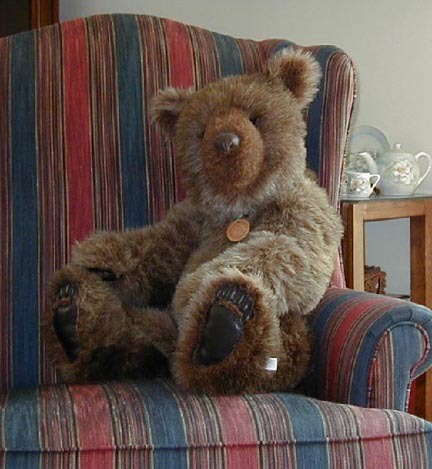 He has a soft leather nose and paw pads complete with toes - all handstitched and padded. A very special teddy, Thaddeus P.J. Bear is as comfortable in a child's world as he might be in a woods visiting his less playful relatives. He may tell storybook tales to bears, jump with Tom's Toad, pad along with Gnome T. Griswold on his way somewhere, or tickle a napping Troll Garnock with a long twig of willow until he awoke in a blustering rage. Wise and childlike at the same time, Thaddeus P.J. Bear is a first class teddy and loves every minute of it.